The Christian is in a different position from other people who are trying to be good. They hope, by being good, to please God if there is one; or — if they think there is not — at least they hope to deserve approval from good men. But the Christian thinks any good he does comes from the Christ-life inside him. 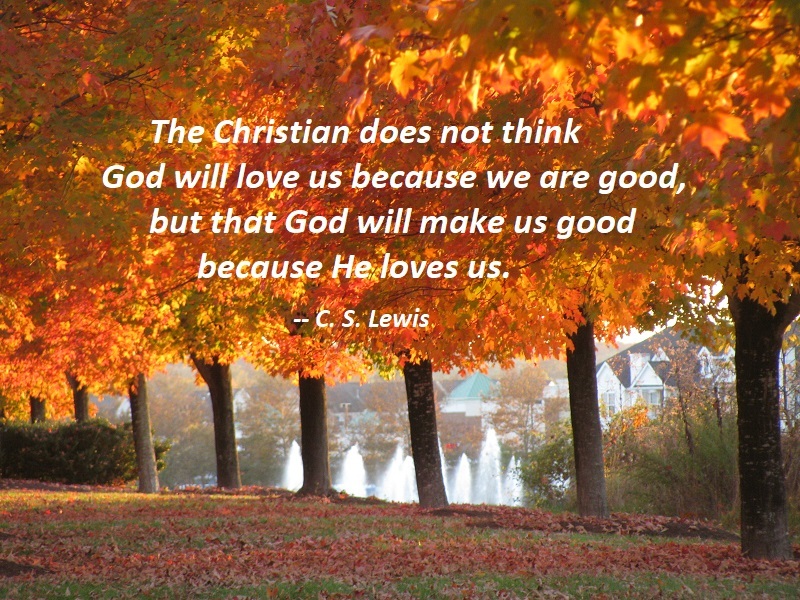 He does not think God will love us because we are good, but that God will make us good because He loves us. To me, this puts the whole idea of guilt and that we can somehow disappoint God into perspective. He doesn’t love us because we’re good. He makes us good because He loves us. Was the Father disappointed when the prodigal son took his inheritance early and chose to squander it and go feed the pigs? Well, it’s not like he was happy with the choice, and it’s not like he wouldn’t feel his son’s pain along with him. But an all-knowing, all-seeing Father would also know that the son He ended up with has much better character, is a much better person altogether than if he had pouted and sulked and not really lived out his rebellion. In fact, he ended up in a better place than his older brother who did everything “right.” So, knowing the big picture, can the Father really be disappointed? He sees His son make a bad choice — but knows that it going to make him end up as a good person — and better than he started out. He loves his son. His bad choices, his treating the father disrespectfully don’t change that. And he knows that in the end, good will come out of his son’s bad choice. And that, to me, is an answer to when I feel like I have let God down. Who do I think I am? Did I think God loved me because I was doing everything right and now I’ve jeopardized that? No, God loves me. God loves me! I do think He watches with joy when I make good choices. And He feels my pain when I make bad choices. But He knows that the circumstances He lets into my life are shaping me into a better person, in spite of myself. And that’s delightful. You are currently browsing the Sonderjourneys blog archives for September, 2018.